As a new high school cross country season begins, there are things parents of aspiring runners need to know to best support their child’s budding interest in this glorious sport. Cross country is its own unique (and painful) animal. And high school cross country, with its range of talent, experience, and intensity among athletes, parents, and coaches, requires some advance preparation and understanding before diving in. First, the setting matters. Races can range from tri or quad meets with just a few teams lining up in a parking lot, to a massive invitational with colorful tents, banners flying and packs of kids running around in every possible shade of bright matching singlets. It can feel more like a medieval fair than a modern day sporting event. “The pageantry of it really struck me,” says Margaret Carpenter, a Virginia-based cross country mom of her first cross country meet for George Marshall High School. “It’s really beautiful, almost military.” At a small meet you will find your kid no problem, but a bigger race may require more coordination. Tim Haight, another local cross country parent, advises parents to “arrive extra early — plan for traffic and parking — you don’t want to miss your child running.” Know the cell phone numbers of other parents, as your athlete may be warming up and unreachable when you arrive at the meet. The weather is also a critical factor both in how you support your child and your own spectating comfort. 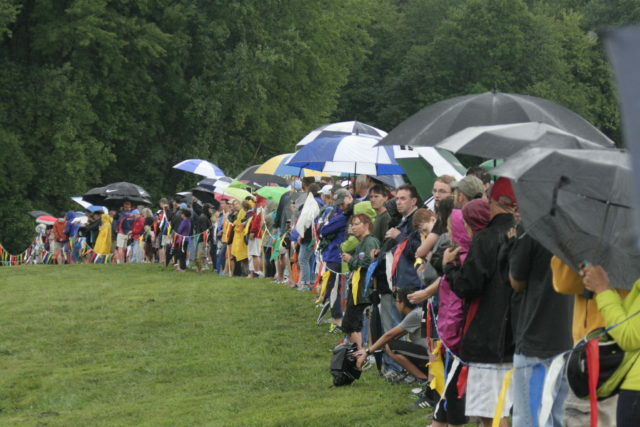 Cross country can start as early as August, with temps and humidity at their most sweltering. If this is the case, a prepared parent will bring lots of cold water–enough for themselves and extra for their kid–and even a cooler full of ice to help the runners cool down before and after the race. Parents coming from work should ditch the suit and pumps and bring a change of comfortable clothing (running clothes encouraged!) and sensible shoes to deal with the dirt and grass of the typical cross country course. Perhaps the most important part of coming to support is having a cheering plan. Look at a map of the course in advance and identify a few places where you can watch. While cheering at the finish line is great, support throughout the race is even better, so look where a course figure-8s, loops (and you can take a shortcut across), or doubles back to maximize the number of times you see your runner. “When you get there, scope out earlier races so you can figure out the good spectating spots so you know where to look for your child,” Haight suggests. Before the season even begins you can start preparing for the demands of cross country. “You have to go to a running store and buy the appropriate shoes,” advises Haight. “Also go to the coach for advice and look into summer running options,” as many teams have casual running meet-ups, often organized by team captains, throughout the summer. Carpenter recommends sending your kid to a running camp if possible to give them the opportunity to discover and fall in love with running culture independent from parental involvement. When it comes to race day, immediately before the race pressure is building, so it’s likely best to leave your athlete alone. Running is an intense sport, and your child will be dealing with pre-race jitters, focus, and team dynamics. Don’t add pressure by asking too many questions or fixating on how good (or not good) they feel. If you are nervous for them (which, as a parent, you very likely are), those nerves will rub off and add additional pressure to an already high-pressure situation. As a supporter, you are there to tell them they feel great and will be awesome. If anything, remind them before the race to trust in their training and to have fun. Afterwards, if they had a good race, celebrate with them! And if they had a rough day, celebrate with them! As long as they tried their best, it counts as a win. Success in cross county takes time. That’s time on a daily basis–time to train, time to rest, time to sleep–and also over the course of years. Focus freshmen on enjoying the experience. As they mature and build mileage and endurance they will inevitably improve, but none of that will happen if they’re not having fun.